The Colour Box: Podlings and fairy crows! 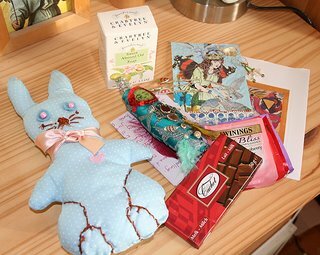 I received the lovely package of ms Daisy Lupin yesterday (my sosf autumn partner), delivered by those mischievous fairy creatures, the infamous Fairy Crow messengers! and a fairy podling who is and has been sleeping soundly for nearly an eternity and might wake up and turn into a fairy anyday now! Oh Maya, your present looks wonderful, I hope you enjoy it all. I love the quirky gifts that are being sent by the secret faeries. Did I tell you that one was sent to my partner ? well it was and the postie stepped into a faery ring (a no-no) and he was whisked off to faery land. I've seen these packages around on a few sites, now...what's the story with them? What a delightful package to get - it really must have made your day! What a wonderful parcel to receive, Maya! 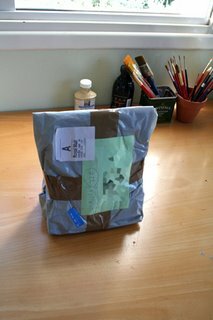 What a great Fairy package fellow fairy firends! I promise!! I miss you too...haven't been around blogger for a while but you are never far from my thoughts! !